Joel and Rachel Bejster of Mendota were expecting their second baby – a daughter. From the start, Rachel’s pregnancy was nothing less than difficult – from undergoing fertility treatments to having a health scare early on in her pregnancy when Rachel suffered a blood clot. The Bejster’s daughter was a fighter – no doubt. A much different pregnancy compared to the one with her son, Bentley. 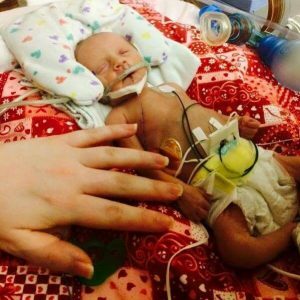 But in January 2015 at Rachel’s 28-week checkup, things took another turn for the worse. What she thought would be another standard prenatal checkup, turned out to be the most frightening appointment of her life. Rachel’s blood pressure was through the roof. 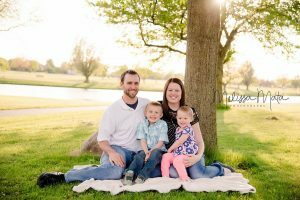 After several tests, Rachel’s care team at a local hospital in Peru, Illinois, concluded that she was suffering from preeclampsia – a condition that affects pregnant women whose blood pressure had been previously normal. Preeclampsia usually occurs after 20 weeks of gestation. Rachel was immediately airlifted to OSF HealthCare Saint Francis Medical Center in Peoria by an OSF Life Flight helicopter. “It was the scariest moment I’ve ever had, not knowing what was going to happen to our baby girl,” Rachel said. Upon arrival to OSF Saint Francis, an ultrasound was performed to check on the baby’s condition. Thankfully she looked stable and healthy. “At that point I was on bed rest and wouldn’t be able to go home until I delivered her,” Rachel said. The doctors wanted to stall the delivery as long as possible, so the baby’s lungs could continue to develop. But by 31 weeks, it was no longer safe for Rachel to be pregnant. On February 4, 2015, Brooklyn Sue Bejster was delivered by caesarian section, weighing 3 pounds, 3 ounces. Brooklyn was immediately wheeled to the Neonatal Intensive Care Unit (NICU) at OSF HealthCare Children’s Hospital of Illinois, conveniently connected to OSF Saint Francis. Like many preterm babies, Brooklyn needed help breathing with a C-PAP machine, and also needed time to grow before she would be released from the NICU a little over 30 days later. Rachel said the NICU staff would always update her and Joel on Brooklyn’s progress and explain things in detail, so the couple could easily understand. When asked what Rachel’s most memorable moment was with having a baby in the NICU, she said it was when she and Joel spent the night with Brooklyn shortly before she was discharged. The NICU staff encourages parents to stay the night and care for their baby on their own before going home to make sure the parents feel comfortable providing care to their child. Today, little Brooklyn is a happy 2-year-old and “is doing wonderful. You would never know she was born early,” Rachel said.